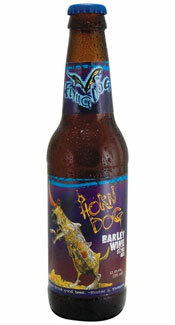 This particular barley wine (which is an award winner btw) is the only one of it's kind offered by Flying Dog Brewery. They age this beer three years before being bottled for sale. Because this beer has such a high alcohol content you can keep this beer for a long time and it will only get better with age (like a wine). Appearance: Big rocky head with great retention, color was a very dark amber. Nice clarity when held up to the light. Lacing was ok but dissipated quickly. Smell: Sweet…really sweet. Malt dominates the scent here. Once your nose get’s used to the heavy malt sweetness you can pick up some yeast and dark fruits. Sadly the alcohol does not go unnoticed with pretty strong alcohol esters finishing off the smell. Initial Taste: Starts off pretty smooth then quickly becomes seriously malty sweet. The seriously vicious malt carries some fruity undertones and alcohol esters. What hops are in this beer are almost completely smothered by the strong malt sweetness, however, there is a slight hop bite that gives a faint relief from the sweetness. The finish is syrupy sweet. Thoughts: Not being a huge fan of the barley wine beers I did not enjoy this beer as much as a fan of style would have. That being said I have great appreciation for the work and time involved in making such a beer. This particular barley wine (which is an award winner btw) is the only one of it’s kind offered by Flying Dog Brewery. They age this beer three years before it’s bottled for sale. Because this beer has such a high alcohol content you can keep this beer for a long time and it will only get better with age (like a wine). The flavor is seriously sweet and strong. Drinkability is pretty non-existent as after one of these I had a hard time recovering my battered taste buds. If you like strong ales and highly flavored barley wines then you are in luck, no doubt you will enjoy this beer. Previous: Happy St. Patrick’s Day! Stone Brewery is always a good chcioe for any style beer. Every beer crafted by these guys is quite good. They’ve never disappointed me and some of their beers like this particular barleywine are excellent.